Something’s odd with the volcano. Fortnite: Battle Royale players have completed the digging at the excavation site in Dusty Divot. But at what cost? Lava has filled up the site, destroying all the chests players had uncovered while digging the dirt and turning the center of Dusty Divot into a hot pool of lava. Players who have spotted the event said lava started rising soon after the last dirt chunk was destroyed, and other players recorded a video of that moment. Prior to the appearance of lava in this site, players uncovered a Volcano Vent in the one near Paradise Palms. These two events indicate that excavation sites are somewhat related to the volcano Epic Games introduced in the island when season eight started. The first site helped to relieve some pressure from the underground, while the second one allowed for lava to flow a bit. If there’s a third site coming and just uncovers something worse, we may witness a disaster. A few players on Reddit also think this may be related to a late April Fools’ joke by Epic. Fortnite players were disappointed when the company ignored the date and made no changes to the game to play around with fans. Maybe drowning 11 chests in a pool of lava is Epic’s way of saying we were fooled. 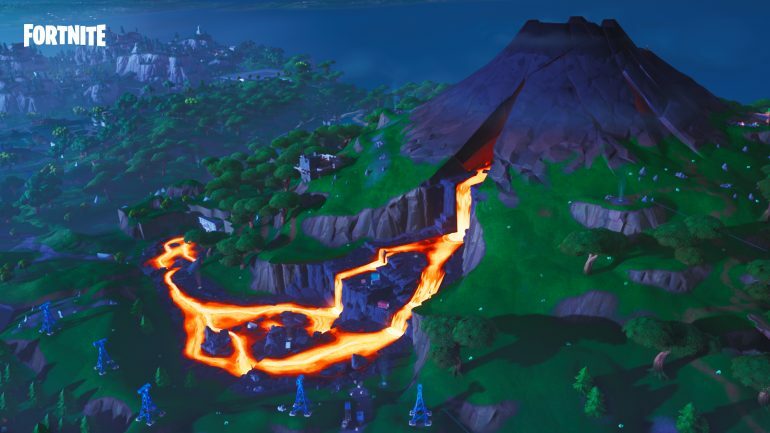 Regardless of what caused this lava to rise in Dusty Divot, we have yet to learn if it’ll continue rising until Dusty becomes a huge bowl of lava or if a third excavation site will give us new clues about why excavation sites exist in the game right now. Meanwhile, we may also learn if the helicopter that’s been flying around the island has something to do with them.